Published in association with Griffith University Queensland Review is a multi-disciplinary journal of Australian Studies which focuses on the history, literature, culture, society, politics and environment of the state of Queensland. Queensland’s relations with Asia, the Pacific islands and Papua New Guinea are a particular focus of the journal, as are comparative studies with other regions. In addition to scholarly articles, Queensland Review publishes commentaries, interviews, and book reviews. 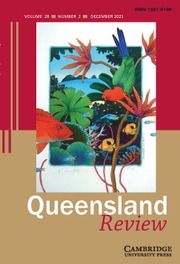 Queensland Review is the only refereed journal devoted to multi-disciplinary Queensland Studies, and provides a unique forum for new research on Queensland. Daryl McPhee, Environmental History and Ecology of Moreton Bay, Melbourne: CSIRO Publishing, 2017, 208 pp., ISBN 9 7814 8630 7210, A$69.95. Maurice French, The Boy Who Would Be Premier: A Political Biography of Jack Duggan (Vol. 1), Toowoomba: Tabletop Publishing, 2017, 226 pp., ISBN 9 7809 8743 2216, not for public sale. 22 April 2019, John Witte Jr.